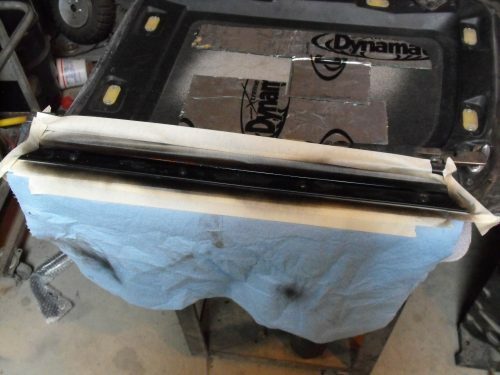 Work continues on the exhaust and finalization of dynamat in a couple of places that I could fit scraps that were directly panels to the outside body. This included the triangles that make up the C-Pillar and support the back window. I also did a section of the firewall up by the ran tray, as well as underneath each T-Top. Painted track with rust preventative, used scraps of dynamat on bare fiberglass section. I didn’t have enough for total coverage of the T-Top panels, but did to get manage the majority of it. This car is going to be crazy silent, and with a major hurtle cleared I could finally work on something else. We decided to keep the factory vynl interior panels for the T-Tops, we just wanted to change the color to black, so I dyed them. 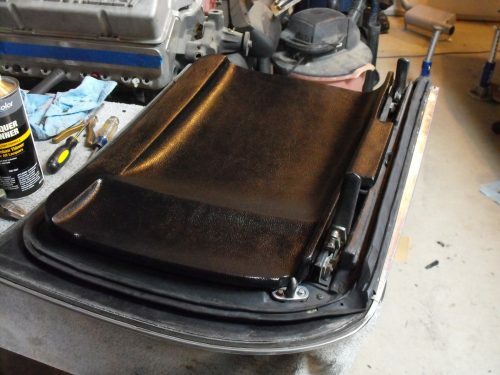 Actually, it was kind of difficult because many of the interior pieces weren’t at the shop yet, but I did manage to find the weather stripping for the T-Tops and decided to refurbish them. It was really interesting scraping off 40 year old rock hard rubber that once kept rain and snow out from inside the car. I was quite proud of my pile on the floor after I had finished cleaning them up. Since the factory T-Tops had glue, and because they are T-Tops and will most likely leak anyways, I decided to use some good rubber adhesive. There was an adequate amount of coverage, but not too much glue. The new clips seemed to snap in without too much issue. The fit of the T-tops after all this installation was complete was, well, interesting to say the least. They fit very tight, I am almost certain that adjustments will need to be made. It is highly likely that someone adjusted them at some point after the seals had started to go bad, so I will be sure and sort this out before the road tip. Completed Restored T-Top ready for final adjustment on the car. I also started on the lock cylinder but it looks like we have an incorrect part issue, I will be sure and get video of the issue tomorrow. What about the Talon? I actually have hours of footage that I need to consolidate down and post on YouTube, I wanted to narrate a bit about what I am doing when I am tuning but we’ll just have to see how that works out.